Last Month Humbug Fishing had it’s first ever all girl fishing charter. 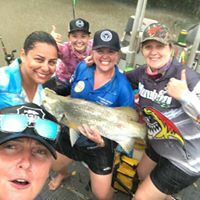 We had 8 awesome ladies experience our 4 day Liveaboard Fishing Charter and the Daly River Mouth for the Barramundi RunOff Season. We had our 2 lady Guides, Paige and Jen out there guiding the girls onto some good size silver barra. Back at the Mothership Megan was cooking up a storm for everyone. The girls had a great time and lots of laughs and have already booked for next year! So get your group of girlfriends together and give a call and we can sort a great girls fishing week away for you too!